Awesome appetizer for 4th of July! These Moroccan Chicken Winds and Goat Cheese Dip Go well with beer and fun. Add the chicken wings to a large bowl, drizzle them with the vegetable oil then toss until the wings are thoroughly coated. Add paprika, cumin, cinnamon, ginger, cayenne, turmeric, salt and pepper. Sprinkle the wings with the spice mixture, tossing until they are coated. Let marinate for 1 hour. Preheat the oven to 400 º. Line a baking sheet with foil. Arrange the wings in a single layer on the baking sheet, spacing them apart so that they aren’t touching. Bake the wings for 45 minutes until they are cooked through and crispy-glazed, then transfer them to a serving platter. Meanwhile, in a small bowl, stir together the cheese, lemon juice, mint, cilantro, honey, milk, salt and pepper. Taste and season the dip with additional salt and pepper as desired and more milk to thin it out if necessary for dipping. 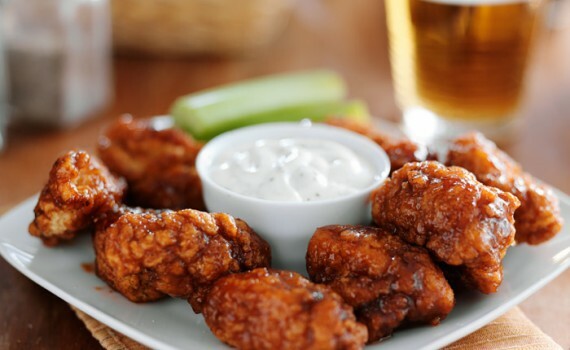 Serve the wings with the cheese dip. 10% OFF Your First Body Care Purchase! Look for the Gift Certificates badge on our shopping pages.